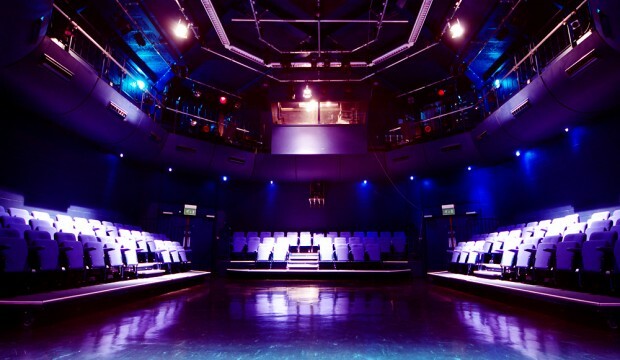 Our productions take place at Central Studio, Queen Mary's College. The audience are seated in front and at the sides of the performance area. * All full paying members who want to be in a show are automatically involved in some way! These are showcases of acting, singing and dance pieces. We have one 'free choice' Revue and one 'themed' Revue each year. This is where members put themselves into the show by getting into groups and bouncing ideas for drama, dance or musical theatre pieces. Members are free to create their own ideas and are fully supported by staff to help when needed. All free choice group pieces need to pass an audition before being entered into the Revue. Auditions open 6 weeks before the show and close 2 weeks before. Members are encouraged to audition their pieces before the deadline in case they are not quite ready and need tweaking. We also set a full cast opening and finale, as well as various ensemble acting, singing and dance pieces known as show numbers. No audition is required for these. Rehearsals for the Revue take place during Stage School sessions during the second half of the term alongside our regular workshops. Additional rehearsals for show numbers take place from 12-1pm after Stage School and can start as early as the very start of the term. This is where we set a theme for the show and all pieces relate to it in some way. Members are put into groups and given a set piece to create. Our last themed Revue was 'Time Travel' and groups were given a piece to make and rehearse from different eras of time, such as World War I, Titanic, and Shakespeare. Our yearly main production is either a play, pantomime or musical. Auditions for named parts in these productions usually take place at the end of the term before the show, or at the very start of the next term. Any member who wants to be in the show is automatically involved in the chorus/ensemble and there is no audition required for this. Rehearsals for named cast take place after Stage School from 12-1pm, and may include a one off Thursday evening during show week from 6.00-7.30pm. Chorus/Ensemble rehearsals begin nearer to the production date during Stage School hours, however chorus are sometimes asked to attend rehearsals after Stage School nearer to the date of the production. Hover over 'Productions' on the menu bar to see our current, past and future productions!